Where does it say that in my rule book? Well I won’t be changing my traveler cards anymore. If you don’t like it just ignore it. I’m tired of changing my cards. So I’ll only change the ones I haven’t shown yet. I’m happy with what my cards are like. And in the end (unless your making a profit off of it which I’m obviously not) my happiness is all that counts. If you can’t figure out how my cards work because they aren’t worded perfectly. That’s your problem not mine. Or change them for yourselves. If I keep changing my cards for you guys then there no longer my ideas. Then it’s not really my fan based expansion it’s someone else’s. Why do you guys think Donald doesn’t like adding fan based expansions to official expansions. Because it’s not the same! And I feel the same way! Which is fine and all, but then maybe don't post them in a forum whose main purpose is to criticise and discuss each other's fan cards. It's called constructive criticism. 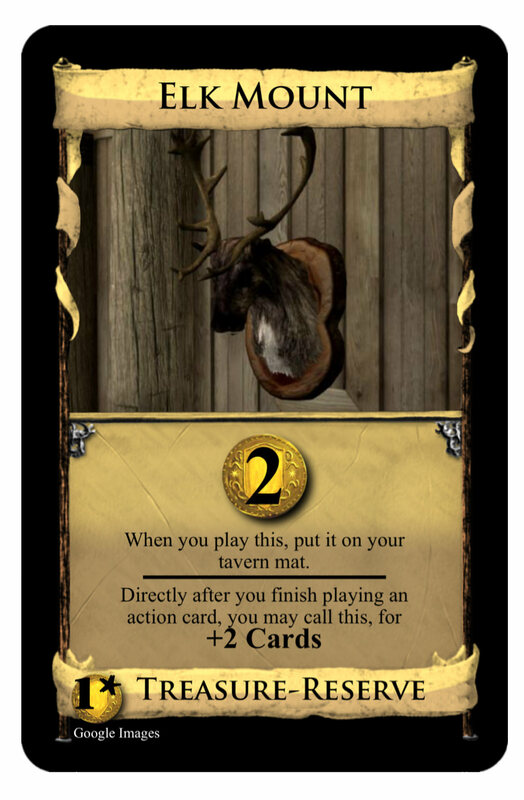 We are trying to make your cards the best that they can be. Even people like Asper don't make perfect cards the first time. I don't think so, anyway . Seriously though, we're just trying to help. Where does it say what? Is this about the no note-taking comment? There have been several discussions on this forum and on BGG about this issue, and it has been made clear that the rule book lists the things that you are allowed to do, it doesn't list every possible thing that you aren't allowed to do. Nothing in the rulebook says that you are allowed to take notes, so you aren't. If you play Dominion with notes, that's fine so long as everyone you are playing with knows about it and agrees; at that point you are just playing a minor variant. This is excessively hostile. People are only trying to help here. Good card design takes a LOT of work. Going through multiple iterations is to be expected. Donald doesn't just make a card and then keep it exactly the same. If making multiple edits is too much work; then it might be good to not start with a version that's already saved into an image. 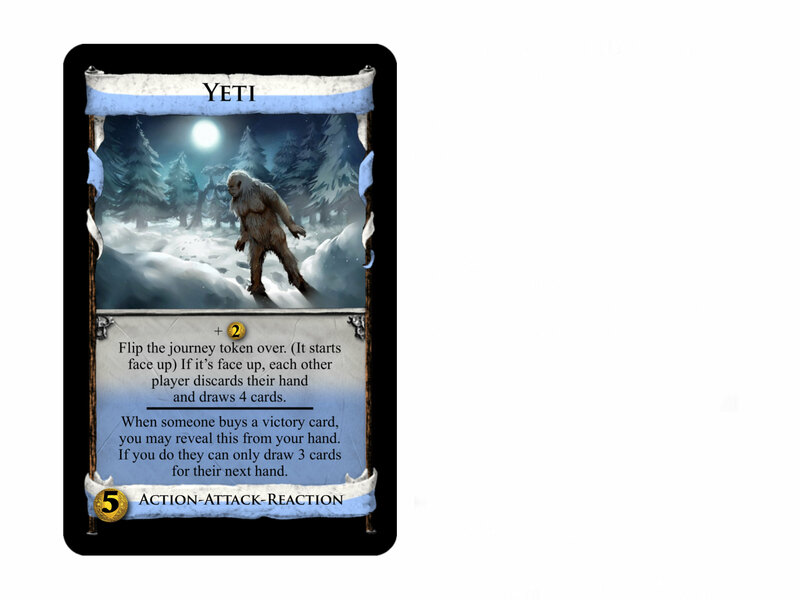 Start with text-only ideas; that way things like wording can be worked out before you have spent too much time trying to make images for the cards. If you only want to make cards for you, and not to be discussed and shared and critiqued and such, then that's fine... no one is stopping you. But in general people who post their ideas on this forum are doing so in order to seek help improving those ideas. The only reason I posted them on here was for fun. But if I get too much criticism then it’s not fun. I don’t mind changing them a little bit. Well I only have a few more to show any way. Then shortly after that I’ll take some time away from the forum. I only wanted to share my ideas that’s it. You guys don’t have to like them. If you don’t just ignore them. Because in my eyes they are fine the way they are. I’m not trying to make the cards as official as possible. 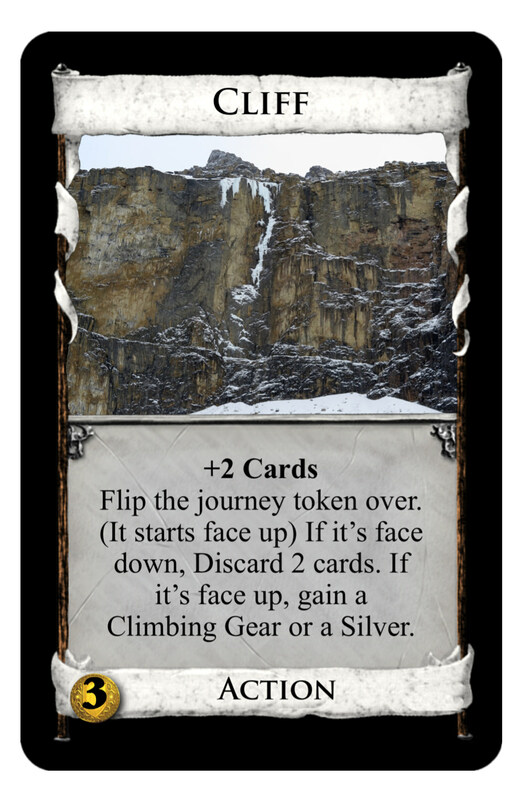 This one doesn’t let you flip the journey token over, so you may still need cliff. However if there other actions that flip the journey token over there will definitely be more strategy involved. I really like Climbing Gear! It's an interesting and unique Herald/Vassal variant. The +2 Actions, +$2 looks too strong, but I get you probably want Cliff to have a village. We're here if you want any other feedback about the designs, after you take some time. Hope you enjoy playing with these at home! Cliff is incredibly weak. Compare Moat: It gives +2 cards without the discarding, along with complete protection from attacks, and it's only $2. Cliff might be balanced at $1, but even then it's hard to think of a situation in which you'd want it. Climbing Gear is too strong. Again, compare Festival: It also gives +2 Actions and +$2, but gives +Buy instead of all of the stuff this gives. Surely this stuff is much more powerful than +Buy. If I keep changing my cards for you guys then there no longer my ideas. Then it’s not really my fan based expansion it’s someone else’s. Why do you guys think Donald doesn’t like adding fan based expansions to official expansions. Because it’s not the same! And I feel the same way! This isn't the right way to look at it. Think of it this way: the ideas are yours, we're just helping you make them work. If an idea is solid it will still be recognizable as yours even after changes to balance it. Donald doesn't publish fan cards because the ideas aren't his, but if you read the Secret Histories of the expansions you'll see how much his own cards were criticized and changed by others before they were printed. Now these two are a split pile. My card ideas are no longer just a pipe dream. I’ve finally created some cards in real life. But boy was it expensive. 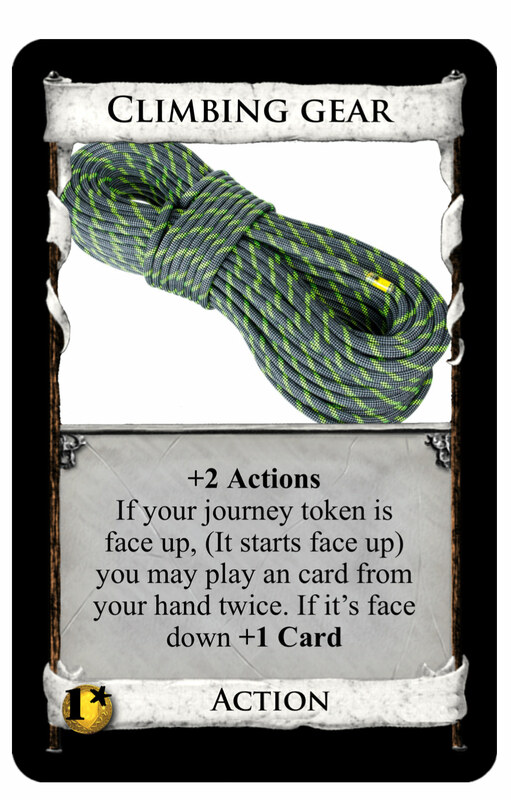 Eventually I’ll try to modify the beginning part of the thread to have all the current cards. However I’ll probably only do a few at a time. 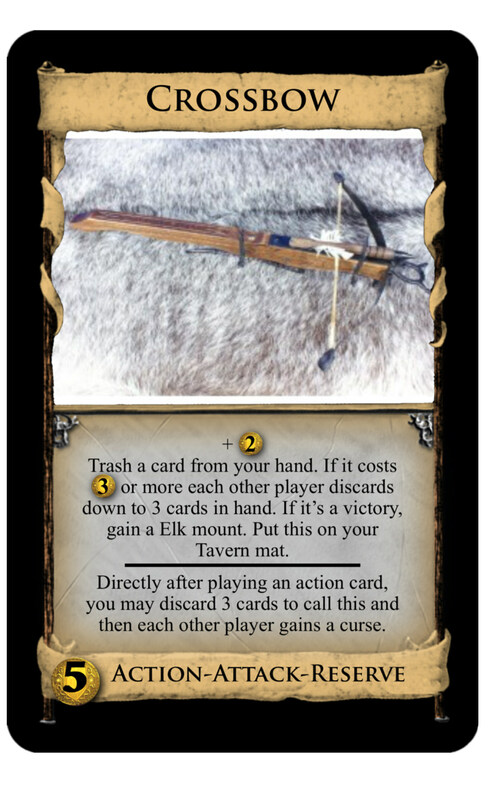 Is Crossbow supposed to go to your Tavern mat when you play it? It doesn't say to put it on your Tavern mat. It's very rare that you would be willing to trash a card costing or more to make your opponents discard. A combination with Fortress is about the only thing I can think of in fact. And having to discard 3 cards to call it is a huge penalty; given that the card costs , I don't see what's wrong with just letting you call it normally. I think what he was basing it off of was Catapult. The key thing to realize here that makes this compare unfavorably to Catapult is that the other half of the Catapult pile is Rocks, which is a prime target for Catapult since it triggers both of the attacks, and gains you a Silver when you trash Rocks. 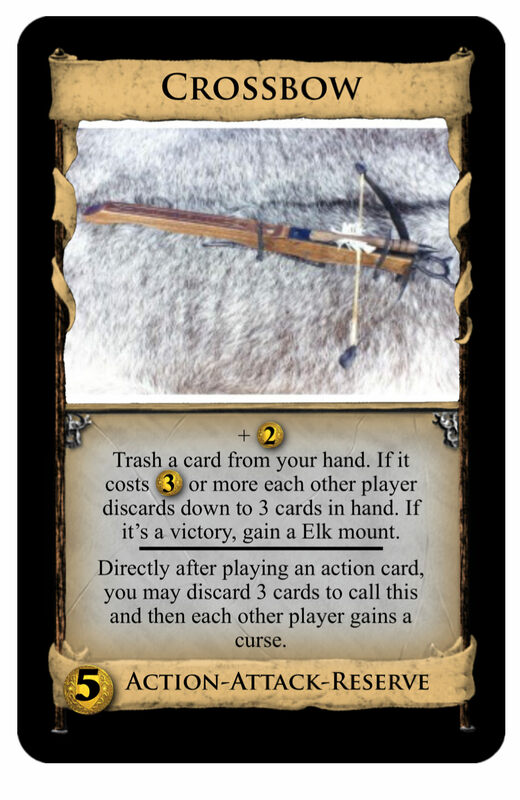 I do see the relationship between Elk Mount and Crossbow, in that you call them both at the same time and draw two cards, then discard three cards. Playtesting would be the best way to get a measure of the strength of these cards, if you already have playtested them a few times then I'm sure they work. Now if you use your crossbow to trash bolts, you get to attack, and then you get to choose your reward. If used crossbow to trash a duchy you would get both too. 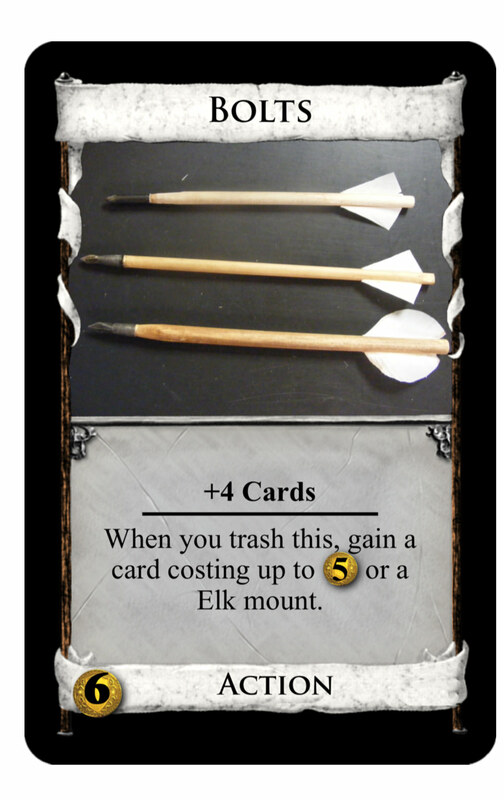 With bolts you get to choose between another card costing up to 5$ or an elk mount. That should work very well at first glance. This card is very strong. It seems balanced when it's the only trasher, or if there's another weak trasher, but in a game with say, Chapel, Steward, or another multi-card trasher, it seems like it could get really crazy. Indeed, just look at it compared to Priest. 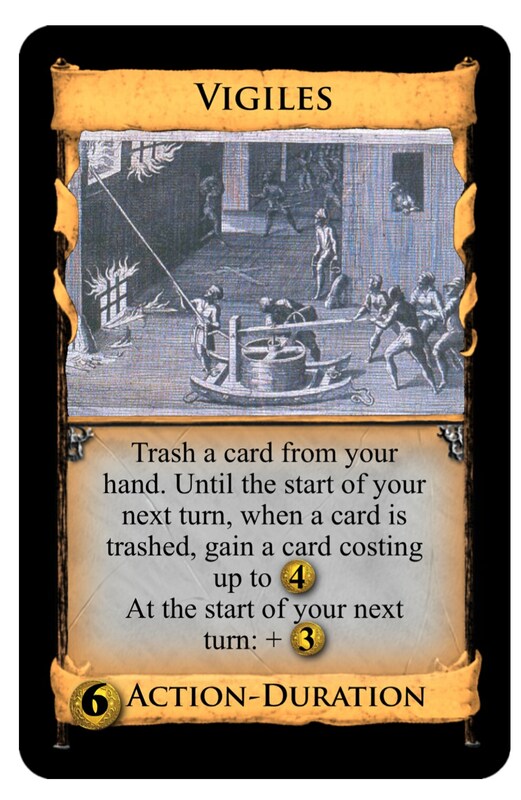 Worth pointing out that it doesn't only work when you trash a card, but also when your opponent trashes any; which means that when you play this, your opponent has to choose whether or not trashing cards on his turn is actually worth it. If it were "for the rest of this turn", like Priest, then it might be ok, though it would be maybe too similar to Priest. It's too strong, but I really like the general idea of Vigiles. How’s my vigiles 3.0 version. 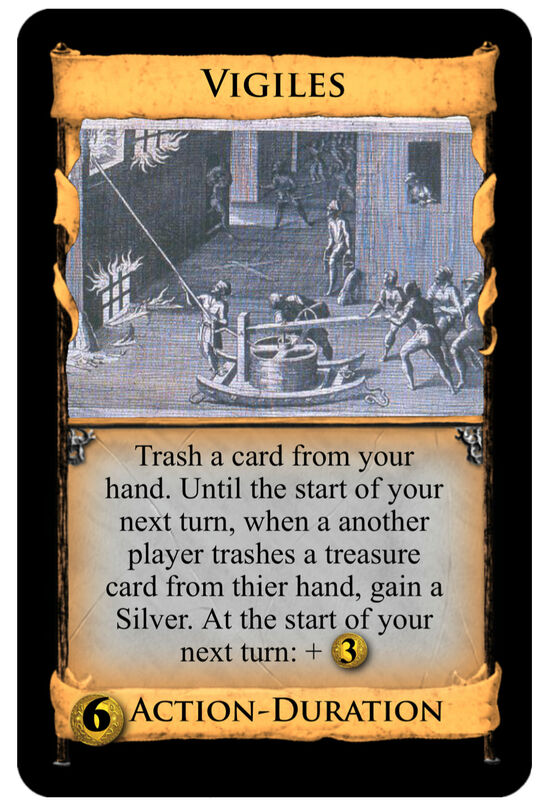 I made it so it only works if another player during thier turn, trashes a treasure from thier hand. No other cards affect it and if treasure was trashed via and attack like giant it still wouldn’t activate. 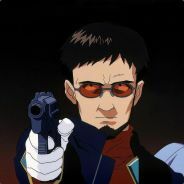 And I also changed it to gain a silver. I’ve started posting my snowline cards at the start of the thread. I’ve got about half of them in the first post.